Consuming stories is becoming instant, social and mobile. Sweek is an open platform to read, write and share stories. All over the world. In an instant. For free. We want to provide writers with the opportunity to write their story, chapter by chapter, reach out to their audiences and get noticed. 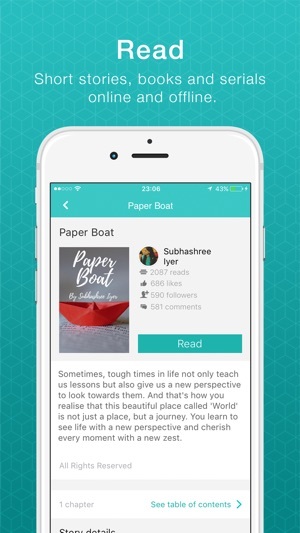 Our readers can always find new authors to explore, interact with them and follow their favourite stories on Sweek. 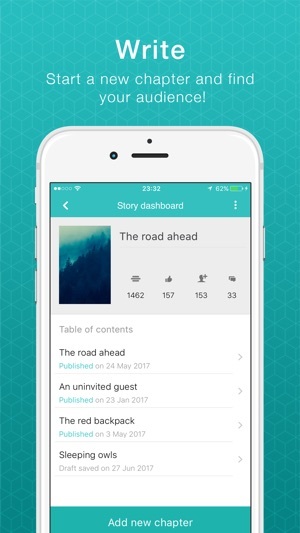 - Whether you are looking to discover upcoming writers, follow well-known authors or catch up with the classics, you can find stories interesting for you on Sweek. For free! Browse our Popular, Top authors and New lists or search for stories per category. 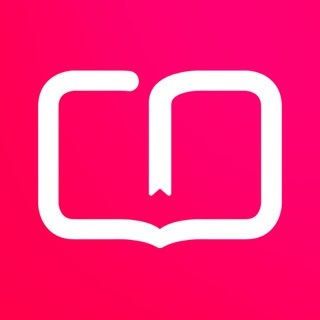 - Read stories in a clean reading interface and set your reading preferences. 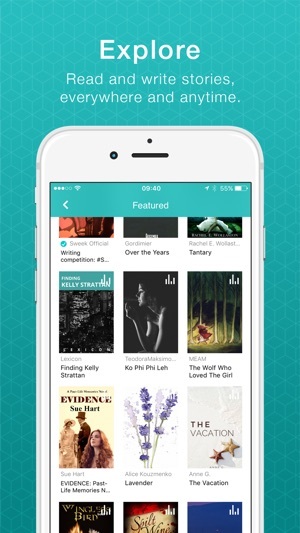 - Save stories to your library to read them later, even offline. Your reading progress will always be saved on Sweek. On any of your devices, be it a smartphone, a tablet or your computer. 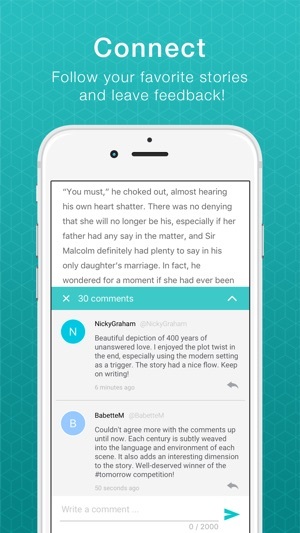 - Show appreciation for writers by liking their Sweek stories, following them and giving your feedback. We invite you to join the global Sweek community. We are there for new novels and thrilling mysteries. For short stories and captivating fanfiction. For literary classics. For inspiring articles. Everybody has a story to tell. And we can't wait to read yours. In this version you can find some new features on Sweek. You can now see users who you are following, filter out Adult Content and have a few extra categories for your stories. Happy Sweeking! Edit: Now whenever I click on the book that I am writing, the app freezes. It just stays on that screen forever. If I close out the app and return it refreshes, but I am still not able to edit my work. 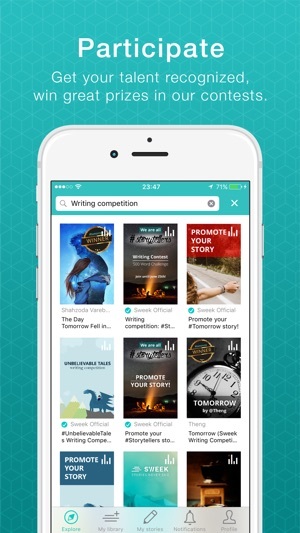 Sweek allows you to write and post your own stories with your own personally made book covers. It also provides you with stories written by other aspiring authors with an addition of a few classics written by famous authors. None of these factors seem to be the problem however, the problem lies within the notification center. Firstly, the app sends notifications that you have a new follower to your profile or a new comment on your story, but when actually going to the app to see the notifications they disappear. Even private messages disappear after a while. Sometimes the app glitches (which is a rare occurrence but it really annoying when it occurs). Won't let you edit your book! I've been looking at reviews of Sweek and noticed I've been having the same error. Got this app today and finished a chapter of my book, and wanted to go back to work on another chapter or two. However, when I go to "My Stories" and tap on my book the app freezes and does nothing, just stays frozen. I exit the app and go back and then the app crashes. Very upset and disappointed. I've been seeing potential in this app, but the good news it has been recently updated, so please update Sweek again so I can continue working on my book! I love this app, and all of the great stories on here. I especially love how people can message you to give comments on your story/poem personally, but unfortunately I can’t read mine. I have “6+” notifications, and every time I try to open them, nothing it said I don’t have any conversations. If I try again, the app closes out and I’m back to my home screen. I’ve tried restarting my phone, and the app, but nothing has worked. I love the app but this is really annoying. Great idea, but the app needs a bit more work. Otherwise it would definitely get the 5 stars.